There was a time where the French toilet experience consisted of “squatting over a hole in the ground” – the same way that is still done in most developing countries. In fact, if you do a Google image search for “French Toilet,” it is clear that the reputation has yet to wear off. The U.S. is pretty concerned with being “green” these days. Maybe not more so than Europe, but it still seems like something that would catch on given the current trends. It isn’t expensive or difficult to implement. These are purely mechanical toilets, just like most American ones; so it wouldn’t drive the design or manufacturing efforts very much to start offering this in the United States, and, supposedly, it saves a lot on water costs. 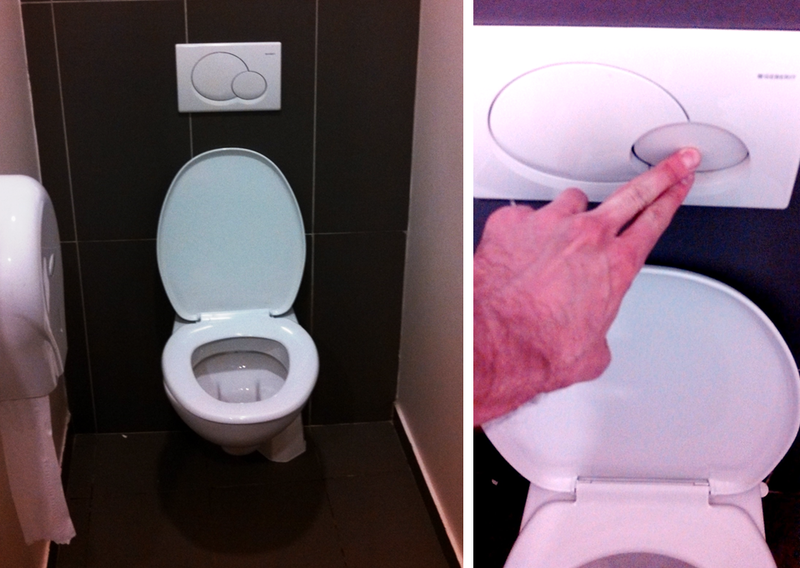 I realize that dual-flush toilets exist in the U.S., but they aren’t common. Here, they are everywhere. In fact it is almost impossible to flush a toilet without feeling guilt-tripped into opting for the smaller option. In any case, little differences like this between France and the U.S. really make you think: why didn’t this technology catch on in both places? What is it about The French that makes them want options when they flush, but not when they choose health care? They’re all over the Middle East as well. At least UAE, Qatar & Kuwait. Here in Iraq it’s a dirt patch. I agree with your mom. They are everywhere in the DC area now.